My wife Linda and I left home at about 1 pm and drove to a Holiday Inn at Reading South on the M4 about 30 minutes from London Heathrow. We always feel more comfortable knowing that we are near the airport in good time rather than dashing up from Cornwall at the last minute with a plane to catch! We stayed there for the night with dinner, bed & breakfast (booked online for the best discount!). After a leisurely breakfast we drove out to a long stay car park at Heathrow Terminal 5 and left the car there (again booked online). We then took an airport bus into the terminal, checked in and then waited until 16:05 for our direct flight with British Airways to Denver, Colorado in the USA. We arrived in Denver after a 9 hour 45 minute flight to the fairly new airport with its large black & white images of native Americans and the sound of their tribal music beating in the background. US border and customs officials checked our ID's and fingerprints etc. and we were then able to collect our baggage and get out of the terminal in order to find a hotel shuttle. The shuttle arrived and took us about 15 miles to the Marriot Springhill Suites where we had a room booked. A great room but all we wanted to do was to get to sleep as we'd missed at least half a night travelling. A guy arrived in a big Lincoln Town car which was very luxurious if a tad ageing. After signing up all the paperwork we hit the highway and headed for the nearest grocery store and gas station. By 12 noon we were just about all set and took the interstate IS25 north towards Cheyenne over the state line into Wyoming. 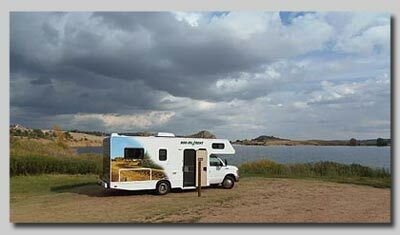 On the outskirts of that town there's a great State Park called Curt Gowdy State Park which allows you to camp right on the edge of the lake. We had stayed here on a previous trip to this area. It was beautiful there but a bit windy and because of the high fire risks we weren't allowed to have a BBQ or any open fire. So it was eat indoors and after a bit of bird watching where I saw Western & Pied Grebes, bluebirds and some unnamed sparrows, it was time to turn in at 8:30 pm as the jet lag was beginning to kick-in! 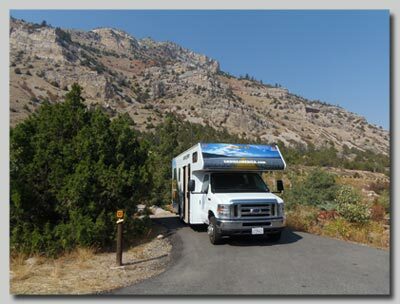 Our Motorhome parked up at Curt Gowdy State Park, Wyoming. After some of the best scrambled eggs ever we hit the highway again heading west toward Laramie and then eventually on to Lander. We'd stayed here before so had a reasonable idea of where we were going and turned up at the Sink Canyon State Park in the early afternoon. Yet again there was a fire risk ban although we were allowed to use a covered BBQ. We didn't have one so we headed back in to town and eventually bought one from an ALCO store. It was then back to the campground and after many attempts I got the BBQ lit and we enjoyed some baked potatoes and steaks along with a few cold beers. It was quite warm in the canyon that evening and didn't get too cold during the night although we had bought an extra duvet whilst in Denver as previous experience had told us that it gets really cold in the motorhome at night in the mountains of Colorado and Wyoming. We travelled from Lander via Dubois into Moran Junction on Jackson Lake where we headed for our favourite campsite at Gros Ventre. It didn't disappoint and we booked in for 2 nights at a beautiful and peaceful spot beneath the cottonwoods which were bright yellow with the autumn foliage. 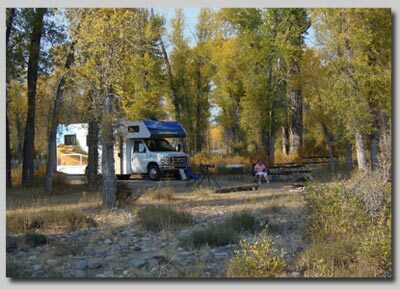 Gros Ventre campsite near Jackson Hole, Wyoming. 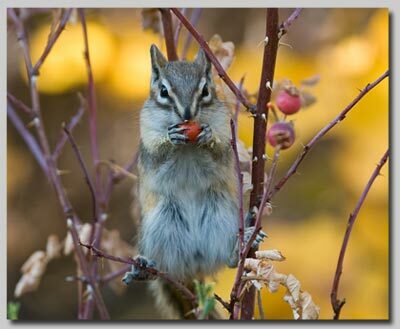 A chipmunk had also laid claim to our camping pitch and I got a few shots of him as he climbed the stalks of wild rose and ate the rose hips. Steaks and jacket potatoes on the BBQ finished off the day as a clear night showed off millions of stars. It's so unusual for us to see such a clear sky away from the light pollution at home. I was out of bed at 7 a.m. and armed with 2 cameras went off in search of moose. 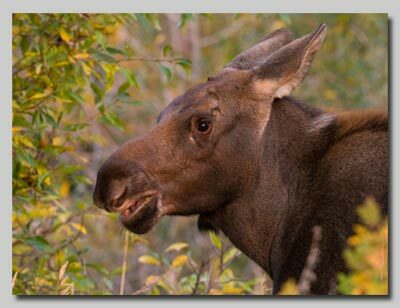 I walked about a half mile along the riverbank through the willows before I came upon a full grown cow moose with her male calf. They were grazing on the willows and reaching high to get the most succulent shoots. After an hour or so they headed for the river which was very wide but flowing slowly with pebble banks on both sides and making up many islands and spits along the route. I photographed both animals as they crossed and also as they grazed on a willow tree on the far side. 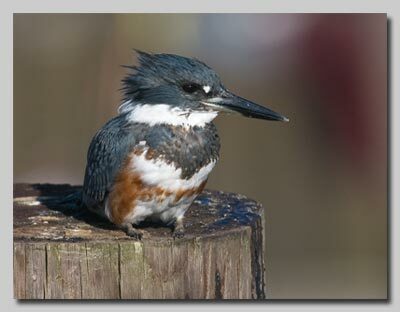 I also saw a Belted Kingfisher on 2 occasions but failed to get close to it with the camera. Belted Kingfisher from a previous trip to the US. After breakfast we headed out across the sage brush plains area of Grand Teton under the imposing Teton Range of mountains that were unfortunately only just visible through a heavy smoky smog which had covered the valley for nearly 2 weeks according to the park ranger. The nearest forest fires being about 18 miles away in more than one direction. The fires were estimated to be covering 68 square miles. Fortunately we'd seen and photographed the Teton mountains before so weren't too cut up about it. 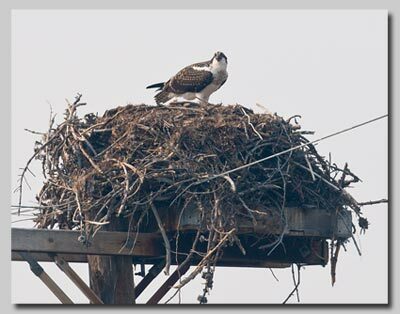 I remembered from yesterday that there was an osprey nest near to the road at Moran Jct. As we drove toward it I passed an immature bald eagle in a tree near the road but there was only one parking space so we went on to the osprey nest where a juvenile bird sat on the nest calling it's heart out. 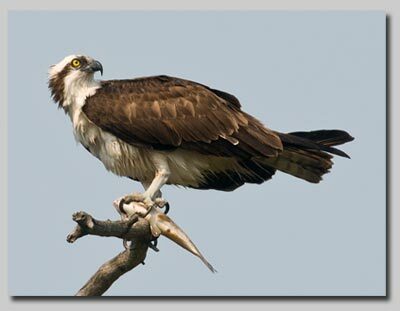 It seemed fairly late for this bird to be still at the nest as most of our British ospreys would have migrated by now. Anyway I managed to get a few distant shots of it on the top of its huge nest of sticks amongst the electricity wires. 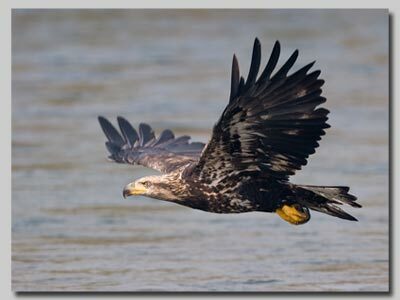 As we went back the road I noticed that the bald eagle was still on its perch and the parking was free so we pulled off the road and I got some good shots of it until it flew down and caught a fish and disappeared upstream with it. We turned the camper around and went back up the road and then caught sight of it on a sand spit in the middle of the river. After another multi-point turn in the camper we got out and took some shots of it until it flew, whereby I managed to get the focus locked onto it and got some great shots of it in flight. We then drove around to the Ox Bow lookout on the Snake River and turned in to an unpaved road that followed across to a quiet area of the Snake River where few people venture... and boy was it worth it! 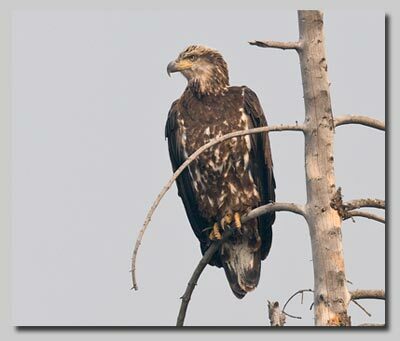 We parked up beside the river and got out the camping chairs and made coffee when another immature bald eagle flew into a tree on the opposite shore. This was swiftly followed by a lot of high pitched calling and an osprey landed in a dead pine 50 metres away with a fish in its talons. The tree was over 50 feet high but I managed to get the 500mm lens trained on him as he devoured the fish. A magpie mobbed it for titbits but the osprey was having none of it. We watched him for ages as goosanders fished the fast flowing current and the odd fishing raft floated quietly down with the current. 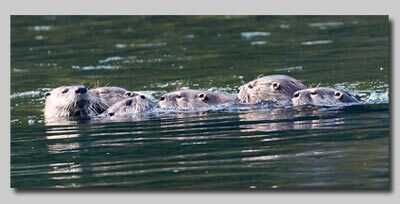 Linda then spotted movement upstream and when she got her binoculars on the area found it was a family of otters. Amazingly there were 7 of them. 6 stayed together in a group whilst the other, the probable mother stayed aloof and kept watch from a few metres away. They dived and twisted and turned for ages and occasionally all got out onto the bank a bit upstream from us. I got several photos of them and they eventually passed right by us on the flow, taking time to hunt together as a family group. Very exciting to watch! Otter family on the Snake river. In the late afternoon we drove into Jackson Hole to go to the stores so that we could top up with food before heading up to Yellowstone tomorrow. We knew where the main store called Albertsons was and close by was a Kmart so we bought another fleece throw to keep us warm when we get up into the mountains. Pork steaks and jacket potatoes on the BBQ accompanied by a few beers and a shot or two of our other purchase today ...some Baileys. (Albertsons have a liquor store next door as you can't buy wine or spirits in a supermarket out there. I was out at 7 again this morning and went off with my camera gear in search of any likely subjects. 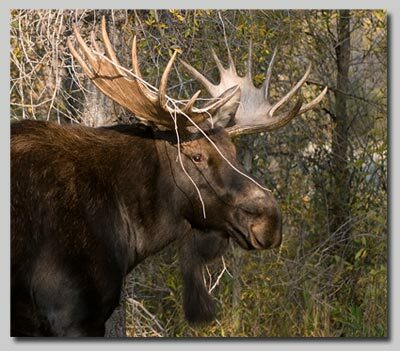 I found our moose in a similar area again but this time there was a bull with the female and her calf. He was pretty frisky and was dashing through the vegetation waving his massive rack of antlers in the willow scrub and carrying bits of twiggy branches on his points. I took a few photos before he decided to go and lie down. I then went to fetch Linda and we both found them again about 45 minutes later. The bull was lying in full sunshine but had his head looking away from us so I was hoping he would eventually move off into the shade or cross the river as the other two had done yesterday. Soon he got up and chased the cow through the scrub making us a bit nervous as he crashed around within 40-50 feet of us. 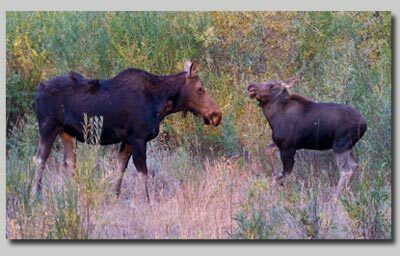 They then both headed to the Gros Ventre River and the cow went down the bank and started drinking. She was followed by the bull and they both spent about 10 minutes drinking from the fast flowing clear water. They made their way across the flow and started feeding on the opposite shore without the calf. 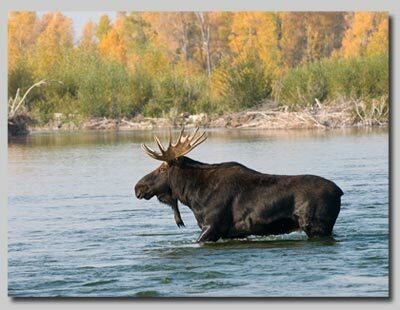 Bull Moose crossing the Gros Ventre river. A few minutes later she wandered toward me calling for its mum. When she caught sight of her across the water she then walked down the bank into the river just 20 feet from me. It was an amazing sight to witness these magnificent animals at close quarters and I'm hopeful of some super photos to remind me of the event. After a good breakfast we set off to drive up to Yellowstone. It was 43 miles from the Jackson lodge area and we were about 20 miles farther again at Gros Ventre. We drove up along the John D. Rockefeller Parkway, an area of land donated to the National Parks System by the famous and rich philanthropist Rockefeller. It is a fantastic day with blue skies and hot sunshine and now we've cleared the Teton park area the smoke has cleared. On entering Yellowstone we spotted our first elk grazing in a meadow and a few buffalo lazing in the sunshine. We passed by Old Faithful on our way to the campsite at Madison Junction on the Firehole River. We'd stayed there several times before and the last time it was fantastic for seeing the elk in rut. I don't know yet if that'll be the same this year or not. After checking in for 3 nights we drove up toward Norris and then onto Canyon village where we'd been told that there'd been a grizzly kill and there were also wolves visiting the spot. We found the area but after standing around for a couple of hours decided to call it a day and drive back for another BBQ of burgers and bacon. It was very tasty and we sat around the campfire drinking Baileys until nearly 9 o'clock under the stars and with the sight and smell from dozens of other campfires creating the “All American Outdoor” experience.